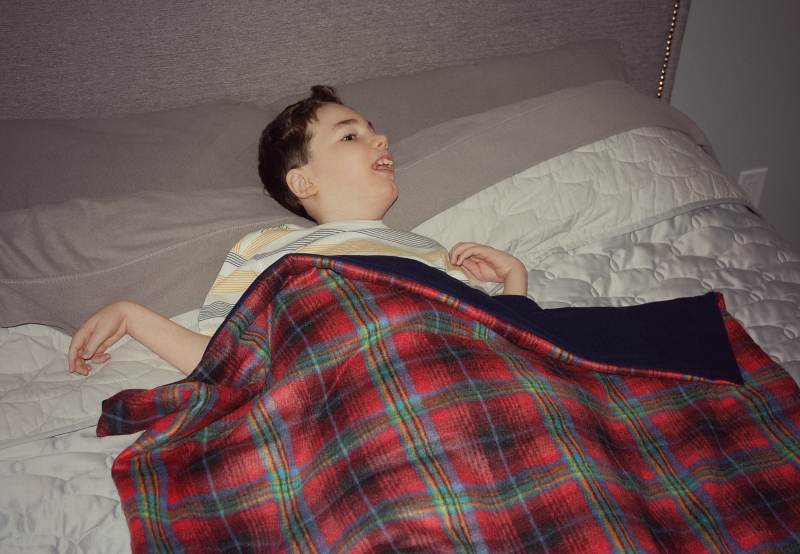 Weighted blankets are becoming increasingly popular in the special needs community, and we recently decided to try one! 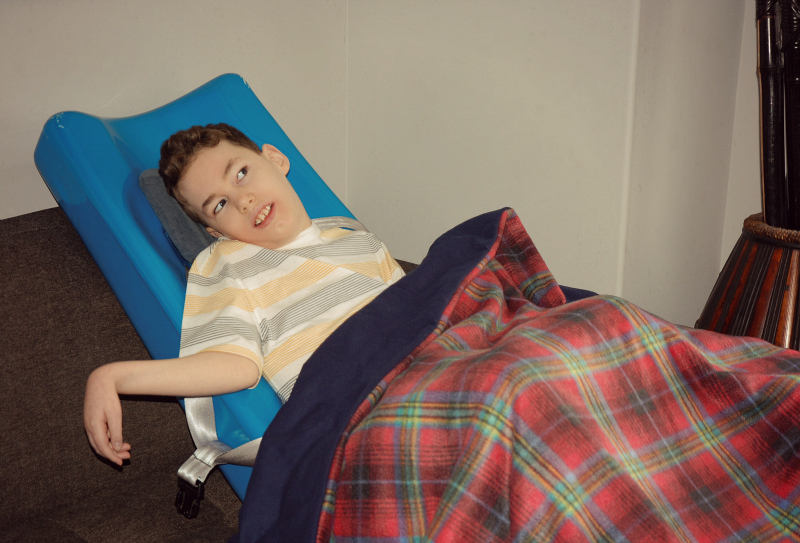 Brennen doesn't have trouble sleeping - in fact he loves his sleep, but he also loves to be snuggled up in a blanket, and he enjoys the feeling of something heavy on his legs. Weighted blankets create a natural calming effect on the body. Deep pressure stimulation causes the brain to release neurotransmitters like serotonin and dopamine that improve moods and induce a calming effect. Like a big hug, weighted blankets can make a child feel secure, grounded and safe. When we were young, my sister and I would often sleep over at our grandparents' house. Our Nan always had a heavy quilt on the bottom of the bed, and I distinctly remember that feeling of being tucked in so tightly you just didn't want to move. It was like a baby being swaddled. It was soothing, calming, and we always slept great! Sensory Goods' company goal is to meet the needs of people affected by developmental disorders. They carry a wide variety of weighted blankets and other weighted items, exercise therapy equipment, sensory swings, oral motor tools, and more. "Sensory Goods' Weighted Blankets are designed to calm the sensory system allowing individuals to rest their mind and body. The result is being able to properly process thoughts and feelings without becoming overwhelmed. Many families have gone months and years without a full night of sleep, or some families experience stressfully restless days from a poor night of sleep. Either way, after just one night under a Weighted Blanket you will begin to experience significant changes. You will see changes in sleeping patterns as well as attitude adjustments in the days following a night under the Weighted Blanket." 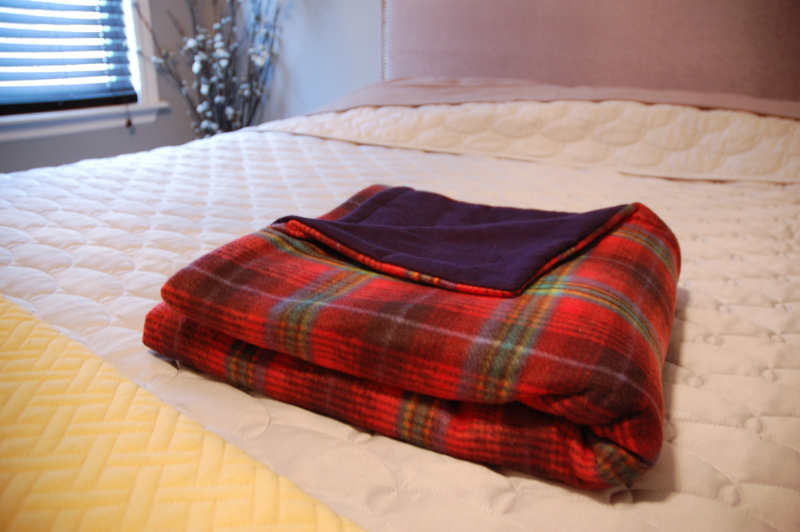 Along with the beneficial aspects of a weighted blanket, Sensory Goods has made their blankets fully customizable by allowing you to choose the weight, size, filling material, and fabric design. We chose a 10 pound, medium size blanket filled with tiny glass beads that are evenly distributed in a quilted material inside the blanket. It is so soft and cozy, and I love the red plaid fleece! A weighted blanket can help individuals with an array of conditions, such as sensory processing disorders, neurological problems, PTSD, ADHD, cerebral palsy, sleep disorders, autism, and practically any type of anxiety. They are commonly prescribed by Occupational Therapists to help improve body awareness, to calm and improve attention and focus, and to decrease sensory-seeking behaviours. Brennen really enjoys the weight of his blanket. He started singing when we first tried it on his legs, which is how we know he is relaxed and comfortable. I love that it is therapeutic without looking like another piece of medical equipment. There is nothing that shouts "special needs" about it. I think that this is something we will use quite often with Brennen - and I will sneak under it myself sometimes when I feel like I could use an extra hug!